A compact light with a bright light output, the Energizer folding lantern is ideal for outdoor entertaining on a back deck or patio and feels right at home on family camping trips and weekend getaways. Equipped with Light Fusion technology, the folding lantern's light panel features LEDs that never burn out or need replacing. The panel has several hundred tiny dots etched on it to evenly spread the light emitted by the LEDs, delivering vibrant, uniform illumination. 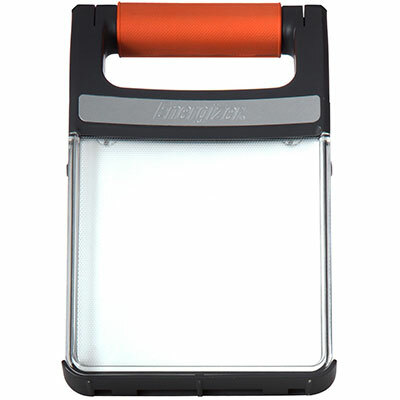 Water resistant and ready to lead the way, the Energizer LED folding lantern also features smart-dimming technology, which makes it possible to vary the brightness to suit your needs and prolong the battery life. Simply press and hold the power button to your desired brightness. • 360-degree area light: Translucent light panel provides 360 degrees of area light. The panel can pivot open to your selected angle, up to 180 degrees when upright. • Stand: a retractable stand on the back gives added stability to the folding lantern. • Flexibility of placement: a sturdy top handle allows for ease in carrying the folding lantern and can also be used to hang the lantern while working outdoors or camping. • Dimmable: press and hold the power button to dim the light to your own custom level; simply press once to receive max lumen output. • Sleek design: compact design closes flat for easy storage and safe transport. • Water resistant: can withstand whatever precipitation Mother Nature has in store, making it ideal for outdoor activities. 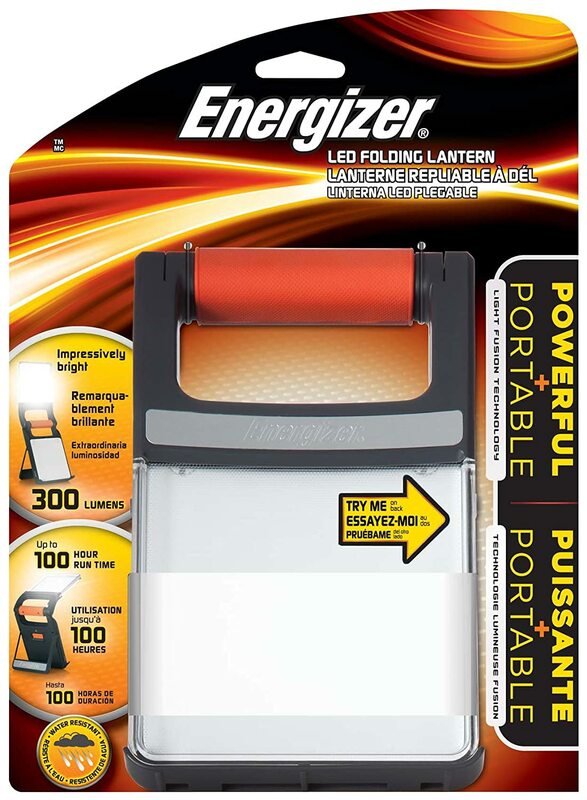 The Energizer LED folding lantern conveniently runs on four or eight AA batteries (four Energizer Max AA alkaline batteries included), allowing you the option to run it on fewer batteries or achieve a longer run time of up to 100** hours with up to 300 lumens* with eight AA batteries. Let us start by saying that the Energizer LED Folding 360 Area Lantern is a more than welcome replacement for the old oil lanterns and candles once used during power outages. This is a really solid, quality, lantern that puts out a great deal of light. On high it's capable of filling a 12'x12' space with plenty of LED light; enough to read without strain from across the room. The LED's sit on both edges of a sheet of plastic that has been laser etched to distribute light. The lighting element can be rotated 180 degrees to act as a hand lantern (like those you might carry while walking) or an area light. It also has a dimmer and a handle that you could hang it from. This should be suitable for emergency home or car use, or camping. It may be a bit heavy and large for backpacking, but might be worth the weight for the light it puts out. Return to the Category "Electronics"